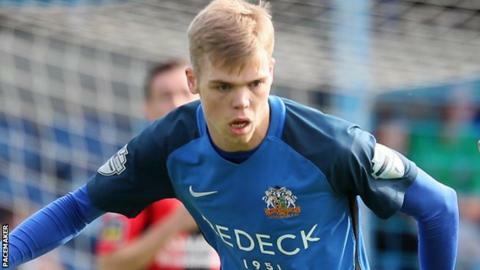 Defender Rhys Marshall is expected to return to the Glenavon team for Friday night's Irish Premiership match away to Crusaders. The versatile 24-year-old missed Monday's 2-1 win at Glentoran because of a minor knock but should be fit for the third versus fourth game. Crusaders' hopes of retaining the title are fading after two defeats in their last four league fixtures. But boss Stephen Baxter was buoyed by last Saturday's 4-2 win over Coleraine. "We were excellent in the second half and it was important to get that win," he said. "Every match we have had against Glenavon over the last five years has been tough. "They have got good players who play in a system they know and like. "They are dangerous because they have players who can score from anywhere." The Crues squad will include 34-year-old defender Sean Ward who recently signed a one-year contract extension with the north Belfast club. Crusaders, who won 3-0 at Seaview when the teams last met in the Premiership, are six points ahead of fourth-placed Glenavon who have a match in hand. But Glenavon player-boss Gary Hamilton hopes the men from Lurgan can maintain the form which saw then pull off that late Oval win on Monday. "We are down to the bare bones because of injuries, but we will give it a go," said Hamilton. "If we play the way we did in the first half and last 15 minutes against Glentoran there is no reason why we cannot get another win."